As a Star Wars fan who focusses primarily on Star Wars movies and television, it is hard not to move beyond those media, especially with all the new materials coming out in print form, whether they be novels or graphic novels. So, to that end, I recently read my first ever Star Wars novel. 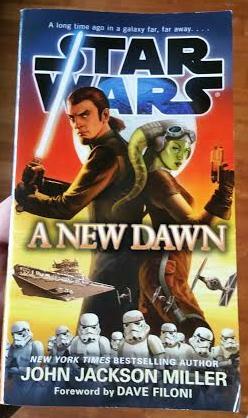 A friend of mine received a free copy of “Star Wars: A New Dawn” at Star Wars Celebration this spring and graciously lent it out to me to read. Having read it, I think I’ll be reading more Star Wars novels! is the first story written in consultation with the Lucasfilm Story Group. The group has representatives who are in the loop on the new sequel movies as well as the upcoming Rebels TV series; their involvement means that events in new tie-in works from A New Dawn forward will be considered as having happened in a Star Wars movie or TV show. Now on to discussing the book, itself. Kanan had gravitated toward a dangerous calling on Gorse, because, to him, it wasn’t dangerous. And it was a solitary trade, so he secretly could call on his prodigious talents if danger struck. She suspected that described all the odd jobs he’d taken on in his life. It was the strategy of someone trained in a certain discipline, and yet forbidden from practicing it. That, his nomadic nature, and his lack of family ties all added up. When Hera comes into the picture, Kanan immediately is intrigued by her as well as attracted to her. He is ready to leave his planet and current situation and go on with her. Even the human who’d helped her against the street gang – whom she now remembered as the man helping the old-timer on Cynda – might easily fit a ready template: the gadabout, looking for a brawl. That would be disappointing, if so, but not surprising: Like everyone else on Gorse, he was trapped in a role the Empire wanted for him. He’d never be a threat. It was too bad: He seemed to know what he was doing in a fight. Kanan saw blasters being raised. His was already drawn. Six – no, seven against one. That’s about right. But before he could fire, Kanan saw the woman suddenly twirl in place. With one swift motion, her cloak came off – and became a weapon she cast into the air like a net. Charko turned back to get a faceful of fabric, dropping his credits in the process. The gang leader stumbled backward, victim of a high kick from his assailant. His friends turned and gawped at what Kanan now saw: a beautiful, lithe, green-skinned Twi’lek, holding a pistol in one gloved hand. The Twi’lek shot one human Sarlacc point-blank in a single motion, and then rushed forward in the next. As the burly man fell backward, the Twi’lek used his body as a makeshift staircase, giving her the altitude she needed to leap for a horizontal strut on one of the scaffolds. Catching the bar with her free hand, she used her momentum to help her gain a perch, clinging to one of the vertical supports. Turning, she fired her blaster down into the astonished crowd. Political activism drew more than its share of crackpots. Some had been legitimately driven to madness by the forces they were fighting against; some had been damaged by war, as she suspected was the case with Skelly. Some had no excuse. But while such people were always the first to revolt, they almost never led successful revolutions. Action against the Empire would have to be carefully measured – now, especially. He recognized the obstacles between them – the debris and the bodies, lying across the fastest route. Without thinking, he swept them away from his mind, clearing a path. No barrier blocked him from Hera. And he moved. He moved faster than when he’d saved Yelkin, faster than he’d remembered moving in years. All in the hope of grabbing her and diving beneath the doorway. She looked at him for a long moment in wonderment before understanding came to her – and a gentle smile came to her face. Responding to some command from the Emperor, clone troopers had eliminated the Republic’s cherished fighting force. It had been a dark day – by far, the darkest in Caleb Dume’s young life. Kanan Jarrus usually avoided thinking about it. When she was a girl, the Jedi had helped her people in the Clone Wars. Although she had been too young then to remember specific events from those days, her father had told her, time and again, of the Jedi in action. Later, she’d watched many historical holos – all of them now banned – of Jedi in action. She understood that Jedi abilities weren’t some suit of superpowered armor that someone could leave at home, or abandon in a garbage can. The Force influenced and enhanced every action of a person touched with it, whether they were conscious of it or not. Kanan would be a great asset to her in the days to come even if he never returned to the Jedi ways. But she couldn’t help but wonder:What would happen if he did? Of course, there are more characters, and other elements in the book, the central part of the story and the central significance of the book is the meeting of Hera and Kanan and how they came into league with each other (or, perhaps, how Kanan joined Hera). It is fascinating to see the contrast between Kanan’s focus on not standing out and just doing blue-collar work, trying to be invisible, while Hera is strategically thinking about starting a rebellion. Ultimately, Kanan is able to join her and her cause. also the story of Skelly, a Clone Wars veteran who spends most of his life trying to make his voice heard when no one is willing to listen. And Zaluna, a Sullustan surveillance expert who believes the Empire is a new boss same as the old boss — until her eyes are opened otherwise. And Rae Sloane, an Imperial captain determined to make a name for herself in this new order, if only to distinguish herself from her politician father. The world of Gorse is a character in and of itself, with only half of its lands ever seeing the light of day. And there’s a brand new villain to hate, with a story of his own.